Test your Disney trivia mojo here. How many of these items do you already know? 1. King Arthur Carousel. 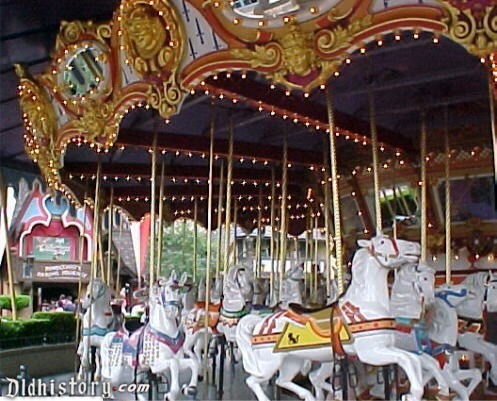 The lead horse on the iconic Fantasyland carousel is named Jingles. Walt Disney wanted all horses on the carousel, and he wanted them all to be leaping, so when a classic carousel was purchased, it was supplemented with other horses and those that had straight legs were redesigned. 2. Main Street, USA. It's an amalgam of several small towns, including Ft. Collins, Colorado, but most closely resembles Marcelline, Missouri, where Walt Disney grew up. All the storefronts were built to 7/8 size with forced perspective, so that they grow smaller on the top floors, giving them a storybook character. 3. Mark Twain Riverboat. The hull of the Mark Twain riverboat was built at the Todd shipyards in San Pedro, but the body was built on a sound stage at the Walt Disney Studios in Burbank and then hauled by truck in 1955 down the brand-new Santa Ana (I-5) Freeway to Anaheim. 4. The Haunted Mansion. It was originally conceived to look spooky and dilapidated on the outside, but Walt Disney didn't want anything shabby in his park, so that plan was discarded. Designers first thought they would build a walk-through attraction, but later added the "doom buggies" to the design to improve traffic flow. 5. Tarzan's Treehouse has concrete roots and the limbs are made from concrete-clad steel. There are 300,000 plastic leaves all added by hand. It originally opened as the Swiss Family Treehouse in 1962, and is in Disney lingo called a "disneyodendron semperflorens grandis," or a "large ever blooming Disney tree." 6. Animatronic birds. The idea of animatronic birds in the Enchanted Tiki Room began when Walt Disney saw a mechanical singing bird in a shop in New Orleans on vacation. He brought it back with him and had his engineers take it apart to see how it worked. Eventually, that led to the tiki birds, Mr. Lincoln, and other iconic symbols of Disneyland. 7. First dark rides. Fantasyland had the park's first dark rides, including Peter Pan and Mr. Toad, where seated visitors were taken through a dark environment livened with black light. It was originally conceived as a medieval fair, with banners and flags flying. 8. Creating Fantasmic! Disneyland engineers had to drain the Rivers of America to install the equipment needed to operate the Fantasmic! Show, and also move the mill on Tom Sawyer Island to build the stage. The show opened in 1992 and has been a hit ever since. 9. First FastPass. The first FastPass used at Disneyland was for the It's A Small World attraction. It premiered in November 1999, after being tested first in Florida. 10. Splash Mountain. The water ride opened in 1989 with animatronic characters recycled from the America Sings attraction. 11. First cartoon. Head to the Main Street Cinema if you want to see "Steamboat Willie," the Mickey Mouse cartoon from 1928 that started it all. It plays regularly in rotation with other vintage cartoons. 12. Club 33. The only private club in Disneyland, Club 33, has a long waiting list for members. It opened in 1967. Its name came from its "street address" of 33 Royal Street in New Orleans Square. It was later expanded to include a lounge, dining room and small market area. It's located behind an unmarked green door in New Orleans Square.